My Portuguese-Hawaiian great-grandma was born in Kailua-Kona on the Big Island of Hawaii and I have grown up hearing stories from my family of how great Hawaii is. Since we lived in Seattle, WA, USA far away from Hawaii, no one ever took me there. But my mom, grandma and great-grandma would go visit whenever they could, after scrimping and saving for months, sometimes even years it seemed. But because I had never been there before I just didn’t understand the magic. 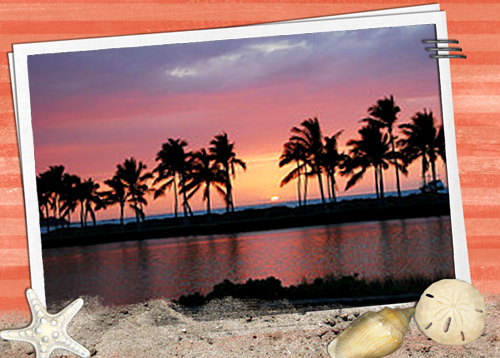 Well in 2000 I went to Maui and found out about the magic first hand. Brad and I loved it, we had the best trip. And no I haven’t scrapbooked the pictures yet! That was before digital cameras and I still have to scan in each one. Some of my favorite memories of that trip to Maui were the Road to Hana dotted with waterfalls, caves and black sand beaches, eating dinner with a group of good friends at Mama’s Fish House, taking a helicopter ride around the island and snorkeling at Molokini. It was so beautiful, warm and relaxing and I have often wanted to return, but the opportunity hasn’t presented itself amidst paying college tuition, home repairs and the like. Here is a little quick page I made to share with you. It is using the SM Design Team’s wonderful mega-collab Hawaiian Happy Hour. It’s free with a $15 purchase from ScrapMatters. I filled mine with a beautiful picture of a Hawaiian sunset I found on Flickr, but after next month–it will be filled with one of my photos. You can download the 5×7 quick page on 4shared here. I got this from my friend Shari (Sharing Creations) and was supposed to put my answers in and forward it on, but thought it would be fun to tag some people with it instead. 2. Real tree or Artificial? Artificial & prelit, I like to make things as simple as possible. 3. When do you put up the tree? When DH or the kids bring it in. 4. When do you take the tree down? Sometime between Jan 1 and 5th. 5. Do you like eggnog? Yes especially eggnog punch. 7. Hardest person to buy for? DH because he doesn’t want me to spend any money on him. 8. Easiest person to buy for? My dad, he always likes the same thing–See’s Candy. 9. Do you have a nativity scene? Seven of them, I treasure them all, but my favorite is a porcelain one that my mom and dad made for me for Christmas one year. 12. Favorite Christmas Movie? Christmas Story…”You’ll shoot your eye out” and just thinking of the leg lamp makes me giggle. This is the same answer as Shari! 3. When do you start shopping for Christmas? Dec 26th for the next year. 14. Have you ever recycled a Christmas present? I believe in regifting and repurposing. 16. Lights on the tree? Plenty of white but I can’t stand flashing lights, they give me a headache. Comet, Cupid, Donner and Blitzen & Rudolph! 20. Angel or Star at top of tree? Angel and then the star is right below her. 21. Open the presents Christmas Eve or morning? It depends, now that the kids are older we mix it up. 23. Favorite ornament theme or color? I collect ornaments from our trips. Also every year since we were married, we have gotten an ornament for each family member and put the person’s name and date on it. Now everyone has quite a collection! 25. What do you want for Christmas this year? Everything I want is too expensive except for love! But here is my wish list: New computer with at least 4 gig ram, new camera–love those rebels, Adobe Creative Suite 4. See it’s a good thing I’m happy to just get love! I tag Britt, Happy Scrap Girl, Kayla, Emilee, Krista, and Kristie, plus anyone else who is interested in playing along. Sale at ScrapMatters Continues One More Day!! Layout share too. To be able to remember the good times is one of main reasons I scrapbook. My niece was getting married and DD1 was one of her bridesmaids. We were planning the bridal shower and just were having the hardest time finding a weekend that would work for everyone involved. So we came up with the weekend before the wedding for the shower. My little sister (mother of the bride) and her husband live 6 hours away and I forgot to check with her if she could come that weekend. She couldn’t leave her responsibilities–she was trying to be noble about it!!! But I could tell she was upset. So even though the first set of shower announcements were out, DD1, the bride and I decided to change the date of the shower to three days before the wedding. 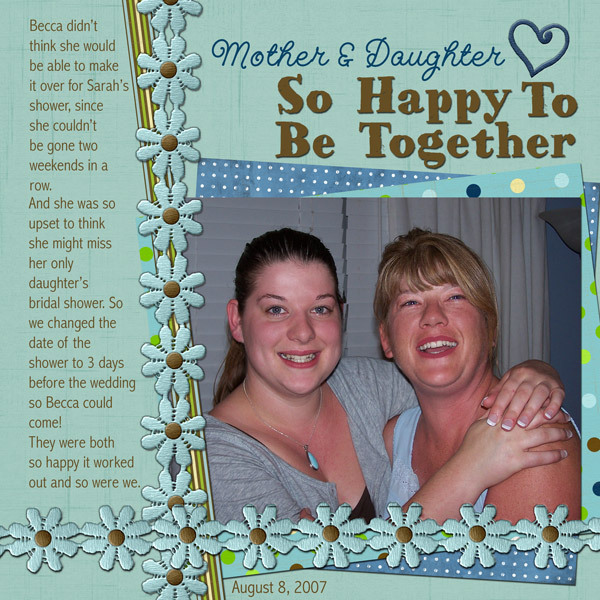 I was so glad that we did that, I would have hated to be the one responsible for keeping my sis from missing her only daughter’s bridal shower. We had a great time, but most importantly my sister and her daughter were so happy to be together they were crying tears of joy. Or it could be that they were laughing so hard they started to cry–either way those are tears of joy in the corners of their eyes. Happy day, happy memories. If you have special memories to scrap check out the 30% off sale at ScrapMatters, it will continue until 11:59 pm PST (GMT-8) November 26th. Every item in the store except grab bags are included. Four of our designers, me, Brittney, Shari and Ellie, have these awesome grab bags in the store for only $3. Also some of you long-time readers may recognize the kit I scrapped the layout with as Waiting for Summer, a kit that I gave away as a blog freebie about 6 months ago. I remixed it and muted some of the colors, added some new embellishments and polished it! While it is not free anymore here is a coupon code just for my blog readers to get 20% off of the new kit Waiting for Summer–Remix. This coupon works in addition to any other discounts–like the 30% off sale!! To get the code click here. See preview below. Hope you all had a terrific weekend. Mine has been busy, but also memorable. 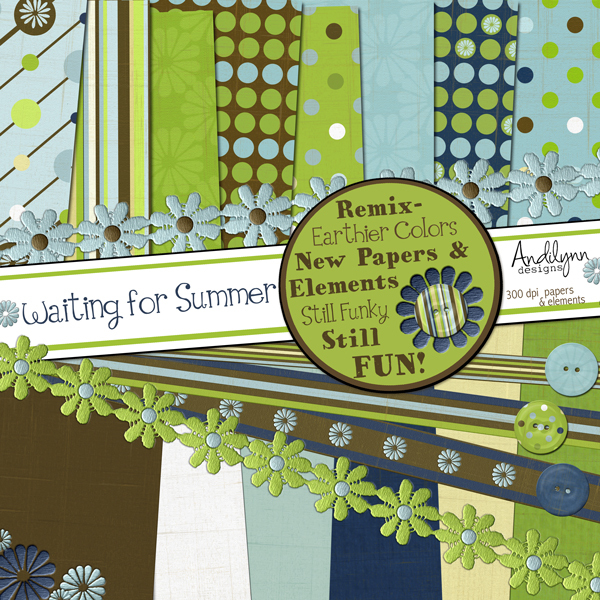 This is a new layout I did for Heritage Challenge #1 at ScrapMatters. 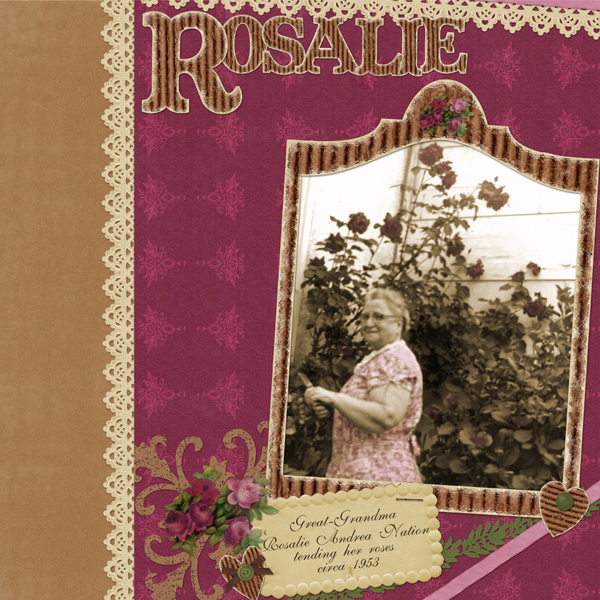 This is Rosalie, one of my maternal great-grandma’s. She lived up to the quote by Francis Hodgson Burnett–Where you tend a rose, a thistle cannot grow. She was always busy, industrious and almost always positive. If you’ve been reading my blog for a long time you may know her as my Portuguese-Hawaiian Great Grandma. She’s the one I made Rose’s Secret Garden for–well at least the one I added the roses for, just so I could scrap this picture. I know it’s kind of a lot of work, to make an entire kit, to scrap just one picture, but I think it is/was worth it! This is really an 8.5×11 inch layout, because that is what fits best in my genealogy notebooks. But just in case I want to bind it into a square book someday I added the tan paper and the lace strip to the left of the real layout to make it an 11″ square layout. I think it turned out great both ways. I can’t believe it’s been so long since I blogged. My new site is under construction and has been taking more time than I ever imagined it possibly could. But it is so much fun. This is like the biggest thing I’ve ever done in scrapbooking. It’s coming along fine, should be up soon–Yeah!!! I have a bunch of freebies all ready to give out in conjunction with the new site. I have some really great designers that are doing a collab kit with me too. Fun, Fun, Fun! Check back in a few days for more info!